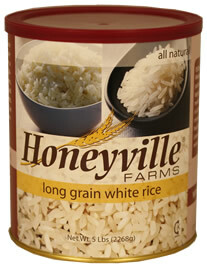 Each case contains (6) 5 pound #10 cans of Long Grain White Rice. Directions: Measure 1 part rice to 2 parts water. Place in large pot and bring to a boil over medium heat, stirring occasionaly. Boil for 1 minute, then cover and reduce heat to simmer. Simmer for 15 minutes, or until water is absorbed. Enjoy!